← “Pic of the Week”, April 5, 2019: Union Point Church, Manitoba. There are actually two observation decks you can visit. 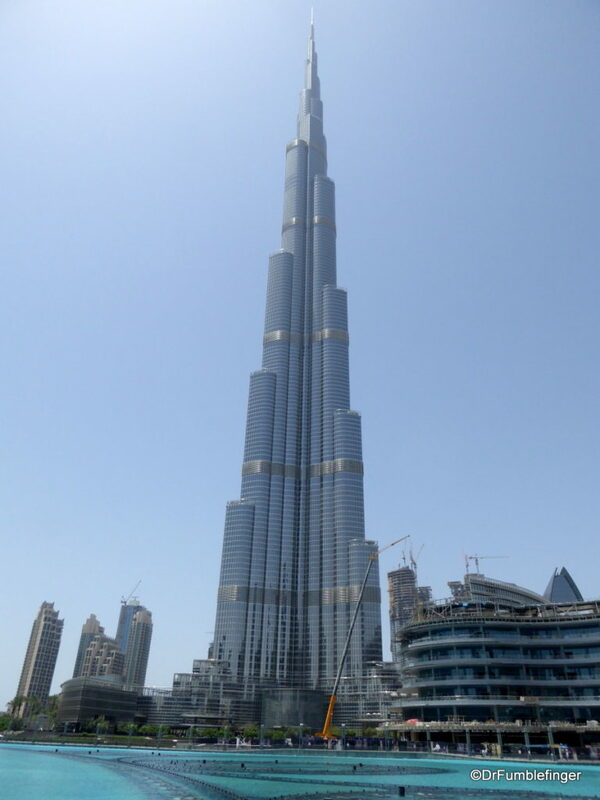 The first one constructed and the one most people go to is “At the Top”, which straddles the 124 and 125 floor. When a taller observation deck was subsequently opened at the Canton Tower, Guangzhou, the Emiratees felt the need to put in an even higher observation level on the 148th floor, known as “At the Top, Burj Khalifi SKY”. 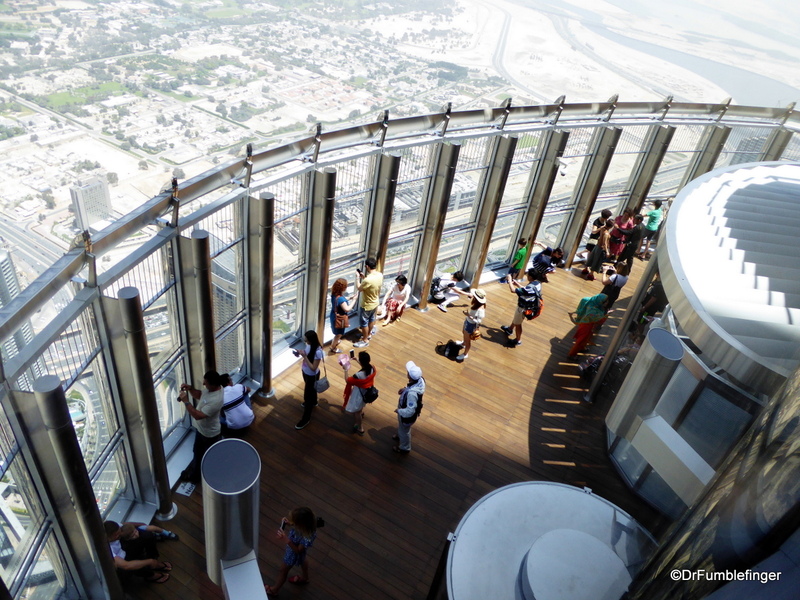 A visit to the latter is almost three times more expensive than a visit to the former, but as a bonus you can also can stop on the 124 and 125th floor when you’re done studying the views on the 148th floor. It likely being my only visit to the Burj Khalif, I decided to splurge on the “Sky” package. The line was blessedly quite short for this option, with only about a 5 minute wait before an amazingly smooth elevator ride wisked a group of us up to the 148th floor. Here you are greeted by a host/hostess who offers you a complimentary cool glass of juice. The area isn’t crowded and you leisurely walk around the inside glassed in view, or step onto the 555 m high outdoor patio (also safely glassed in) for a surreal view. The outside is oven-hot, even though the strong breeze cuts through the narrow cracks between the safety glass. The views are almost surreal. As is often the case in Dubai, dust was blowing and obscuring distant panoramas, but the area around the Dubai Mall was quite clearly visible, as was the Dubai fountain. 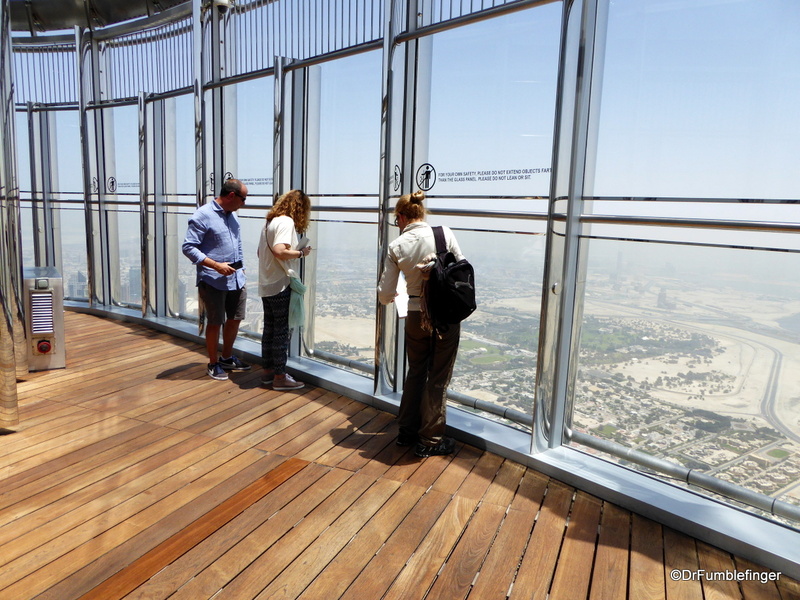 When done at the 148th floor, an elevator takes you down to the 125th floor, where things are much busier and more crowded, but you are afforded a somewhat closer look at the buildings around the Dubai Mall. When done, you simply take an elevator to exit. I visited the Dubai fountain show mid-day as my schedule didn’t allow me to stick around for the evening lite fountain-show viewing. Here are some of the photos I took of the views from the Burj Khalif. The haze is common as the desert winds blow dust around the city.